We have shown that in an isosceles triangle, the angles opposite the congruent sides are congruent. This was the Isosceles Triangle Theorem which we proved two weeks ago. 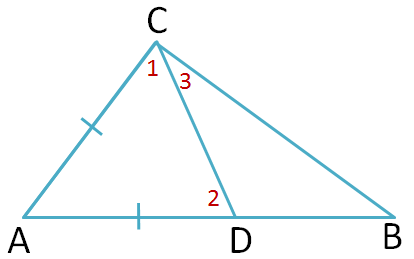 In this post, we are gong to learn a slightly related theorem: a theorem that states that if in a triangle, two sides are not congruent, then the angles opposite these sides are not congruent and the angle opposite to the larger side is the larger angle. In the triangle above, is greater than . We will show that they are not equal and . 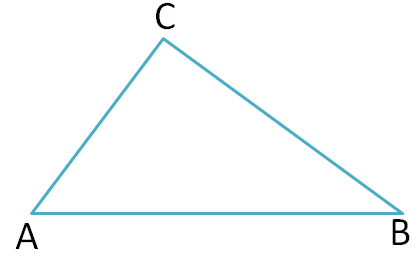 If in a triangle, two sides are not congruent, then the angles opposite these sides are not congruent and the angle opposite to the larger side is the larger angle. Locate point on such that is congruent to . Draw . The resulting figure is shown below. By the Isosceles Triangle Theorem, . Since both the measures of and are positive, . Again, since both angles 1 and 3 are positive, (Why?). This means that which is what we want to show. Sometimes we forget the complexity behind some of the things that seem simple or which we do automatically! I did not know this theorem, but it seems so obvious that angle C is greater than angle B.